get lost in the shuffle. The formation of networks is one of the primary ways that the Affordable Care Act (ACA) aims to reduce health care costs. Accountable care organizations (ACOs) are networks composed of hospitals, clinics, physician practices, and other providers who work together to offer coordinated care and who receive financial compensation for meeting specific patient outcomes. The assumption is that coordinated care will reduce spending as these groups work together to be accountable for a patient population. In this new model, the primary care physician is at the core of the ACO and oversees each individual's care. But where exactly do social workers fit in when it comes to ACOs and how will ACOs change the way they practice? In general, the ACA creates opportunity for the profession and social workers can serve important roles within ACOs, but they still must continue to demonstrate their value. "Having social workers included in this new model is so important," says Robyn L. Golden, ACSW, LCSW, director of health and aging at Rush University Medical Center in Chicago, who presented on this topic during the NASW conference last July. "That's because this new model is strongly based on patient outcomes and those outcomes have facets outside of the medical model. Managing diabetes, for instance, is not just about regulating blood sugar but also knowing that you have the car fare to get to your doctor's appointment or that you'll have food on the table that night." Considering that payment reform is part of this new model and there will likely be financial incentives based on patient outcomes, it behooves physicians to pay more attention to the effect of a patient's socioeconomic factors and other issues that may impact overall health. Social workers are known to be adept at keeping patients healthy once they've left the hospital. The ACO model is built around an increased focus on preventive care, an area in which social workers generally excel. "Many of the functions that social workers serve are roles that they've long held," Golden says. "We've always made sure that patients are being heard, and that factors outside of their medical care are being addressed. But now that this new model puts a lot of emphasis on factors such as reducing 30-day readmission rates, the social worker's interventional role is getting a lot more attention. It can bend the cost curve—and that's why it's so important in health care reform." The Institute of Medicine recently released a report that demonstrated some of the importance of social and behavioral factors in terms of overall health. "We need to be able to say, 'We've already been doing this a long time—now let's work together,'" says Sarah Gehlert, PhD, MA, MSW, the E. Desmond Lee professor of racial and ethnic diversity at the Brown School at Washington University in St. Louis, and an instructor in the department of surgery of the School of Medicine, who also presented on the topic of ACOs at the NASW conference. "The medical world has flirted with the importance of social factors for a long time, but only since unnecessary readmissions and the associated cost factors have more strongly come into play has true attention been given to those factors. Suddenly people really care about social factors. This is the perfect opportunity for social workers to step up to the plate and say, 'This is what we do.'" While social workers already have many of the skills necessary to be effective in this new model, it still means changes both for them and the way they practice. The work environment itself is changing and Gehlert says that the way in which social workers are trained also needs to be addressed. "As we look at this new model the big question was, 'How do we better prepare social work students?'" Gehlert says. "So I started trying to get information out of social workers who were already in the health care field: Where did they wind up? What are the biggest issues they face? Who do they work with?" Gehlert found that while social workers knew theory and interventions, they didn't always know how to work well with other professionals. They lacked understanding when it came to "medical speak" and were often shy. It was obvious there were many issues to tackle when it came to better preparing social workers to succeed in this new medical model. Communication is among the skills that might need some honing. Among other changes, Gehlert implemented a medical terminology and communication course in which social work students could become more comfortable speaking with medical professionals. A key part of the course involved deconstructing medical terms and helping social work students better understand or interpret their meaning. The course also included tasks that would help social work students better demonstrate their value and explain what they do. "For the first assignment I told students to imagine they were on an airplane and the person sitting next to them asked, 'What do you do?'" Gehlert says. "How would they sum it up to the general public with just a minute or two to speak? What I found at first was they used a lot of social work jargon. So we worked on how to explain our profession to a more general audience." This task may be among the most critical right now as social workers aim to find their foothold in this new model. "We still have to build our case," Golden adds. 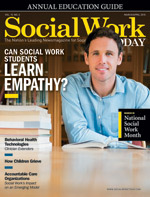 "Yes, social workers are desired in this new model. Finally we're being given more recognition for the value we can add, but this is not the time to become complacent. Social workers need to make sure they're at the table and part of the conversation. We have to speak up. Too often social workers are talked about as part of this new model but aren't the ones actually sitting at the table having the conversation. We need to be an active part of this reform." Gehlert agrees. "By nature social workers are often humble but being modest at a time like this isn't doing anyone any good," she says. "We really need to fight for our role within this new medical model and we need to demonstrate our value. We need to be able to talk about ourselves and about where we fit into the big picture. It may be obvious to us and it seems as though it's becoming more obvious in the reform process but it's not a given." While social workers have been mentioned many times in health care reform discussions and were even part of a briefing at the White House that specifically addressed the role of social work education in health care reform, there is still progress to be made. In its current written form, the ACA does not specifically mention social workers among the "providers" listed under ACOs. NASW has argued that the definition of ACO professionals be expanded to include social workers among its providers. "That's just another example of why we cannot become complacent," Gehlert says, regarding the lack of mention. "It is a constant challenge to ensure that social work is at the table in the changing field of health care. Somehow social work didn't get named specifically as a profession under the description of ACO providers. While it's assumed we're considered one of those providers, I think most of us would like to see social workers get more specific recognition in the ACA, ensuring our place as valuable providers within the model." While many have compared ACOs to health maintenance organizations (HMOs), Stacy Collins, MSW, associate director of health reform implementation at the Association of Maternal & Child Health Programs in Washington, DC, explains in an article written for NASW that unlike HMOs, "ACOs are explicitly health care delivery organizations rather than insurers that can contract with a network of providers." Also distinct from the HMO model is the fact that "individuals will be retrospectively assigned to Medicare ACOs based on where they receive the plurality of their care." ACOs are financially incentivized to provide high quality of care and must meet ongoing quality measures to qualify for those incentives. But perhaps most notable is the fact that a patient in an ACO is not required to stay within the network as they are with an HMO. To date, most ACOs are in the developmental stages, says Collins in the NASW article explaining the new model. As these models expand, new opportunities for social workers will also grow. Collins wrote: "As ACO development progresses, social workers are advised to become aware of—and involved in—ACO activity in their states and communities to position themselves for an active role in these organizations." Possible roles within the ACO model include behavioral health providers, outreach specialists, supervisors for ACO community health workers, advocates for vulnerable populations, participants in ACO governance structures, and members of community health teams. The latter are state-run, federally funded multidisciplinary teams that will collaborate with local primary care providers to coordinate disease prevention, chronic disease management, care transitions, and case management for individuals. Many of these roles involve skills and tasks that social workers are already doing and applying them within an integrated model that has an interdisciplinary approach. "In describing the need for social workers in health, Richard Cabot, MD, wrote in 1905 that social workers and physicians are natural allies," Gehlert says. "Cabot said that they have a lot to learn from one another. Social workers bring moral strength and outside factors to the table while physicians can teach social workers to be more scientific. They bring two critical pieces to the puzzle together." Gehlert says social workers and physicians working together is a good thing. Within this new model of integrated care, the opportunities for social workers have the potential to truly take off. As a result, the preparation needs to start now. "The opportunities are vast and it's ultimately good for health care in general that social workers adopt more roles within the field," Gehlert says. "We're just in a transition period right now and change is never easy. But as more schools of social work do what is needed to help prepare social workers for the changing field, it will be a smoother transition. It's all happening very fast and the time to step up is now."